We have had an unusual winter in Kalamazoo. First off, there was a lot of snow in November, then it warmed up and the ground was bare all of December. A polar vortex (or two) was the highlight of January with extreme cold spells followed by warm spells to melt all the snow. As I write this, we have had another round of cold, high wind, and ice. The falcons have weathered the crazy weather and are spending a lot of time at Peregrine Central. They stay in Kalamazoo during the winter as there is plenty of food to eat and open water available at the river. During extreme cold spells, we may not see them for a couple days, but they don’t seem to leave their territory for very long. 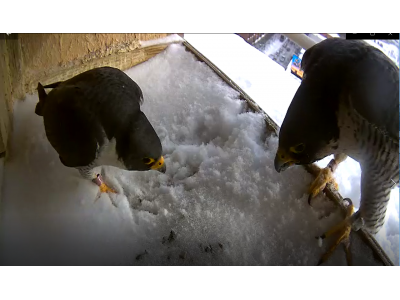 They visit the nest box frequently and Kewpee especially will perch on the edge and survey the territory for long periods of time. They have created and maintain the scrape (depression) in the gravel where the eggs will be laid when the time comes. Both Rebecca and Kewpee do this by pushing the gravel behind them with their feet as they lay on their bellies. Last year, the first egg was laid on March 16, so stay tuned for more updates.